I have been a volunteer for three years now, predominantly in northern France. I’m nobody special – I’m a mum to four kids who was seriously ill and wanted to do more before I die. 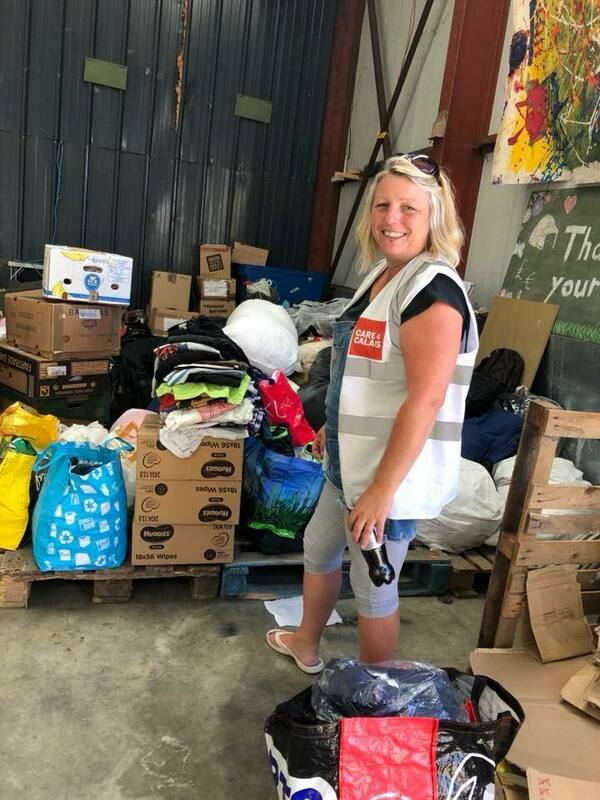 I initially came to Calais to deliver the donations I had been collecting from south west France – I arrived with my husband and a new Facebook ‘friend’ with a van and a car and trailer. What I saw in 48 hours left its mark. So began my journey…. I was always an ‘independent’ and over the following two years I was privileged to work alongside many groups and I went all over France and Greece, however as the situation changed in northern France I was drawn back. I was aware of the fragility of the circumstances. I brought different friends with me who had never been and I volunteered when possible for as long as possible. I especially liked the fact that despite the name 😉 Care4Calais was supporting refugees further afield. In particular Dunkirk / Grande Synthe has a piece of my heart. It always calls me back and knowing I could remain under the umbrella of a registered charity which distributes aid with dignity mattered to me. I have seen, heard and embraced many situations – often difficult and each and every time I have been fully supported in every difficulty. Going to Dunkirk recently and seeing the situation as it is now was soul destroying for me personally. We all worked so hard to get families – everyone – into a more stable situation at la linière …. when that burnt down refugees once again fled into the woods … to see how in three years nothing is improved – in fact it is worse – it’s worse because three years down the line, the fourth winter, there are less donations, less money, next to no media coverage and much more desperation with this air of hopelessness – I was absolutely devastated. So I left Dunkirk upset, doubting myself and the point of everything. We go back to the warehouse. We have a debriefing. I off load completely. I’m so upset – I’m crying and then I felt so much calmer. I look at the volunteers in that debriefing- all ages many ‘newbies’ and yet we were a team … so instead of feeling sorry for myself we worked out what we can do for our next distribution and we keep on going. Without these steps put in place by Care4Calais for volunteers I would not have spoken about my feelings and I would have buried them as I have been doing for three years. No system is perfect, no charity or organisation is. But when you volunteer for one who puts your safety and well being as a priority whilst also doing all it can; with people who are there, every single day, no matter how hard it gets, no matter how futile it feels, you cannot help but feel part of something more, something significant. Just recently there has been a new ‘thank you’ system introduced at Care4Calais. The star fish system. Each and every volunteer gets a small laminated card that fits in your purse / wallet with a star fish on it. It means we can all help someone – even if it feels futile for US at times it does impact on those we try to help. Donate – Volunteer – Spread the word. Refugees all over the world need us. Please don’t give up. Please help.